Traditional menusiers of West Africa will travel great distances on foot to find naturally bent crooks from trees or rootstock grubbed from the marigot. From these, they fashion two things primarily, similar in form but close to opposite in function. 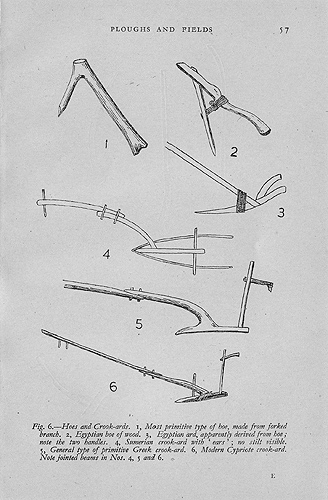 Hoes are the main products, usually with a hand-forged iron blade, but occasionally with a wooden one if the stock is adequately hard. At dawn during the seasons of cultivation or harvest, men of the village hustle off to the fields, their hoes slung loosely over one shoulder, the handle’s natural curve designed to rest gently against the small of the back. Hands are free to swing while walking and to gesture to elders during elaborate morning greetings. Like the ubiquitous coup-coup, or machete, the hoes are a multi-purpose tool, used as often for building up earth mounds to grow yams as they are for breaking apart and mixing soil, termite mounds and cow dung to make banco, an earthen building material. 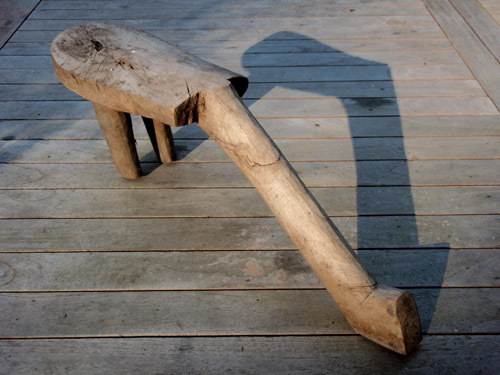 The second product of the menusier’s crook is a market stool, used by village elders too old to squat without some support when socializing on market days. Apart from a prominent chair for the local chief, these are often the only seating structures to be found. When a farmer has reached an age and level of prosperity, and no longer actively cultivates, he may still be seen with the familiar ‘hoe/stool’ over the shoulder on the way to the market, walking in pairs, talking and dressed in the finest boubou. As he squats by the chukatu lady, ready for the day’s first calabash of millet beer to be ladled, he deftly tucks the stool between his lowering body and the ground in a relaxed but precise gesture. For the prosperous farmer, the same shape passes from being an implement of work to being a prop for leisure and emblem of prestige. The market stool is a good example of how when something is no longer useful, its shape can retain symbolic significance. Posted by Scott on February 3rd, 2009, at 10:20 am, and filed under all, bioregion/vernacular, comfort.